EUGENE, Ore. – March 29, 2018 – If your idea of a perfect dog is an abstract rendering of canine qualities extracted across many encounters in your life, you are not alone in how your brain connects memories, say University of Oregon scientists. 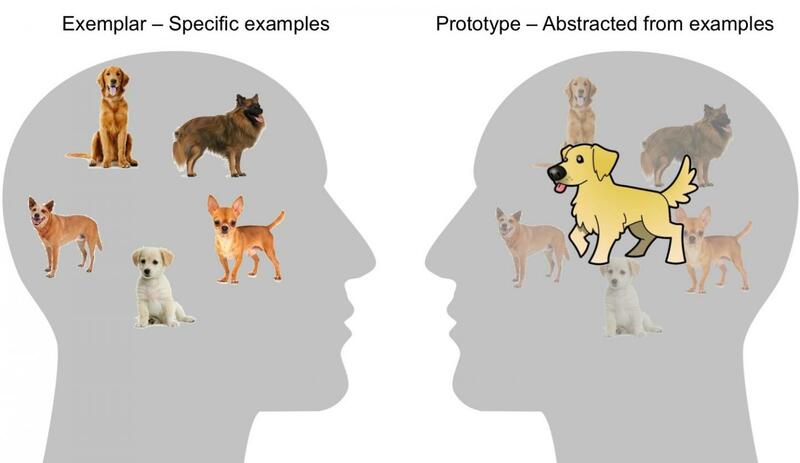 A long debate has existed in psychology whether concepts, such as a dog, are represented in the mind as a collection of specific dogs that people have encountered or whether individuals can abstract the key characteristics across specific examples to form a generalized idea, or prototype, of a dog. Without knowing all the dogs someone has seen before, it may be difficult to tell whether people can recognize a new animal as a dog because they rely on a comparison to specific dogs or rather their prototype. Knowing more about the ability to build abstract memories, the researchers said, could help educators develop new strategies for teaching concepts. In an experiment aimed to uncover how concepts are represented in the brain, 29 participants, ages 18-28, first viewed several novel cartoon animals as examples from two different concept categories whose members were related to families called Romeo or Juliet. Researchers then used functional MRI to watch the brains of participants as they viewed new, previously unseen cartoon animals and chose which family was the best match for each. Responses revealed that participants must have formed and relied on abstract representations – the prototypes — of the new concepts, reported Caitlin Bowman and Dagmar Zeithamova of the UO's Department of Psychology in the March 7 issue of the Journal of Neuroscience. The fMRI data allowed them to follow processing across the brain as decisions were made. They documented activity in the anterior hippocampus and ventromedial prefrontal cortex that was consistent with a retrieval of the prototype rather than specific concept examples. This finding suggests the hippocampus — previously considered a filing system for specific memories of individual events — has a role in conceptual memory formation. "There have been doubts whether or not memories can be generalized, abstract representations that are more than just collections of specific items," said Zeithamova, a psychology professor who heads the Brain and Memory Lab. "There have been very few studies that have looked at the brain to try to tease this out." Previous studies have tried but failed to find evidence for abstract concept representations in the brain, probably because of their approaches, said Bowman, a postdoctoral researcher in Zeithamova's lab. "We found that having enough consistency, enough similarity across new experiences, contributed to building abstract thinking," Bowman said. "If you only use penguins and flamingos as examples of birds, it may be impossible to form a coherent concept of a bird." In the project, done in the UO's Robert and Beverly Center for Neuroimaging, the researchers used artificial creatures as stimuli to examine what features subjects processed and remembered, Bowman said. Following training, participants went through a series of trials while in the MRI scanner. New creatures were presented with a slightly differing color, shape of the body, head, feet or tail, orientation of dots on the body, neck patterns or directions the heads faced. "We watched conceptualization in action," Bowman said. "We found that people form these abstract memories by linking across different examples. While the hippocampus has been thought to only represent individual memories, here it seems to work with the ventromedial prefrontal cortex to create these abstract memories." It may be, Zeithamova said, that the hippocampus allows people to generalize. "You recognize a newly seen creature is a dog, because it looks like your neighbor's dog or like the one that bit you the other day," she said. "This may allow you to remember specific events but also helps you put them together." The findings provide fundamental new knowledge about how memory works, Zeithamova said, and eventually could lead to new strategies in educational settings that help students to consolidate new information with previously learned material to build stronger cognitive maps of various topics. "Traditionally, we've thought that there was a division of labor between memory systems that allow us to remember specific individual events versus those that allow us to generalize across multiple events," she said. "We show here that the hippocampus contributes to the generalization of concepts and works with the ventromedial prefrontal cortex in real time to organize experiences according to their similarities and differences." The National Institutes of Health, through a grant from the National Institute on Aging to Bowman, funded the research together with funding from the Lewis Family Endowment, which supports the Lewis Neuroimaging Center.